Named one of Food & Wine’s Best New Chefs in 2008, Chef Tentori continues to add his unique style to each dish he creates. Chefs like Giuseppe Tentori are the exact type of Chefs that helped catapult Chicago into a world class city. I would like to thank Chef Tentori for sharing his recipe for “Homemade Saffron Bigoli with Duck Ragout” with us. It’s dishes like this that guarantees your very bright future. Grazie Chef! When Giuseppe Tentori was a young boy helping out on his grandmother's farm in the small town of Lodi outside of Milan, little did he know the impact it would have on his future. It was there that he developed a strong connection with nature and that, along with the straight from the garden to table approach he experienced, helped shape Tentori into the passionate chef he is today. He considers himself lucky to have fallen in love with cooking at a young age. At 14, he knew he wanted to be a chef. After finishing his culinary studies at Antica Osteria la Rampina in Milan, Tentori was invited by Chef Gabriel Viti to work at his restaurant in Highland Park, Ill. Without speaking any English, the then-19-year-old Tentori "jumped on a plane" and started working at Gabriel's. From there, Tentori went on to become Sous Chef at the Metropolitan in Salt Lake City, Utah. A couple years later, he returned to Chicago and began working at Charlie Trotter’s, where he spent nine years honing his craft, the last two as Chef de Cuisine. An experience that allowed him a lot of creative freedom, he says, along with an atmosphere that encouraged the sharing of ideas and techniques. 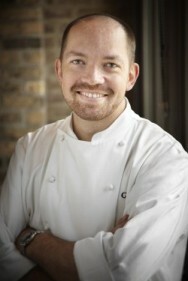 In 2007 Giuseppe took the job of Executive Chef at Boka Restaurant. After just a year in the position, Giuseppe fulfilled one of his dreams by winning the prestigious Food and Wine’s Best New Chefs in America. He has also been named a Rising Star by Restaurant Hospitality Magazine and Star Chefs, and has been a James Beard Semi-finalist the last three years. Under Tentori’s watch, Boka has been rated three stars by both the Chicago Tribune and Chicago Magazine, and earned a 4 Diamond rating from AAA. In his current position as Boka Group’s Corporate Chef, as well as Executive Chef/Partner at Boka, Tentori adds his unique style to the progressive American cuisine the seven-year-old restaurant has become well known for. Along with an emphasis on local and seasonal ingredients - Tentori is a regular at the city's farmers markets - looking for innovative pairings that have become his trademark. "My style of cooking is simple and clean," says Tentori. "Simple in that I like to keep the ingredients pure, using a spice here and there to take the product to the next level. Clean in that I don't use too much butter or cream so my guests feel comfortable when they get up from the table." The menu will change regularly, with Tentori tweaking it here and there to reflect the best of what the seasons offer. Later this year Chef Tentori will open GT Fish & Oyster in River North. "Homemade Saffron Bigoli with Duck Ragout".